This book explores how humans in the Renaissance lived with, attended to, and considered the minds, feelings, and sociality of other creatures. It examines how Renaissance literature and natural history display an unequal creaturely world: all creatures were categorized hierarchically. However, post-Cartesian readings of Shakespeare and other Renaissance literature have misunderstood Renaissance hierarchical creaturely relations, including human relations. Using critical animal studies work and new materialist theory, Bach argues that attending closely to creatures and objects in texts by Shakespeare and other writers exposes this unequal world and the use and abuse of creatures, including people. The book also adds significantly to animal studies by showing how central bird sociality and voices were to Renaissance human culture, with many believing that birds were superior to some humans in song, caregiving, and companionship. Bach shows how Descartes, a central figure in the transition to modern ideas about creatures, lived isolated from humans and other creatures and denied ancient knowledge about other creatures’ minds, especially bird minds. As significantly, Bach shows how and why Descartes’ ideas appealed to human grandiosity. 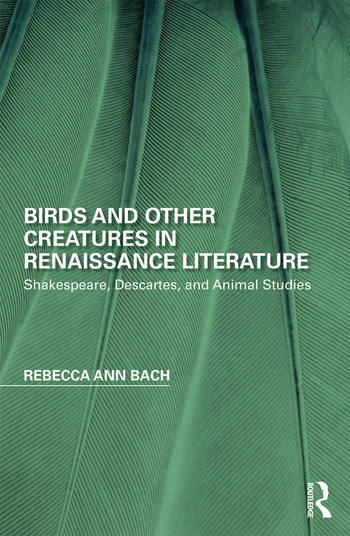 Asking how Renaissance categorizations of creatures differ so much from modern classifications, and why those modern classifications have shaped so much animal studies work, this book offers significant new readings of Shakespeare’s and other Renaissance texts. It will contribute to a range of fields, including Renaissance literature, history, animal studies, new materialism, and the environmental humanities. Chapter Four: Falstaff and "the Modern Constitution"
Rebecca Ann Bach is Professor of English at the University of Alabama at Birmingham, USA.